Happy Easter! I hope everyone is enjoying copious amounts of Easter candy. I’ve been stuffing jelly beans, sour gummy worms, and cupcakes in my mouth all weekend. Starting tomorrow, I’m quitting cold turkey. No more candy, no more cupcakes, and no more caramel sauce in my iced coffee. I may go through sugar withdrawals, but I’ll have to stay strong. From now on, it’s back to fruit, whole grains, and veggies. Not only are we celebrating Easter today, but it’s time to celebrate #SundaySupper. I was going to share my mac and cheese recipe with all of you, but I forgot to measure the ingredients. I’m not used to measuring when I cook. Don’t worry, next time I make it, I’ll make sure I remember to measure. However, I did remember to measure the ingredients for the greek pasta salad I made. This is one of my favorite pasta salads. It’s packed with veggies, feta cheese, and kalamata olives. Yum! We celebrated Easter a day early since some of our family members had to travel home on Easter day. We had a very casual dinner- barbecue style. We grilled chicken, hamburgers, and sausage. I made corn on the cob, greek pasta salad, and a few desserts. My mom made her famous green beans and was the grill master for the day. When the food was done, all of us gathered together and enjoyed the little time we had with each other. To top the day off, we sat around the fire and had a few cocktails and roasted marshmallows. Enjoy your Easter! Cook pasta according to the package instructions. Drain, rinse under cold water, and drain again. Set aside. 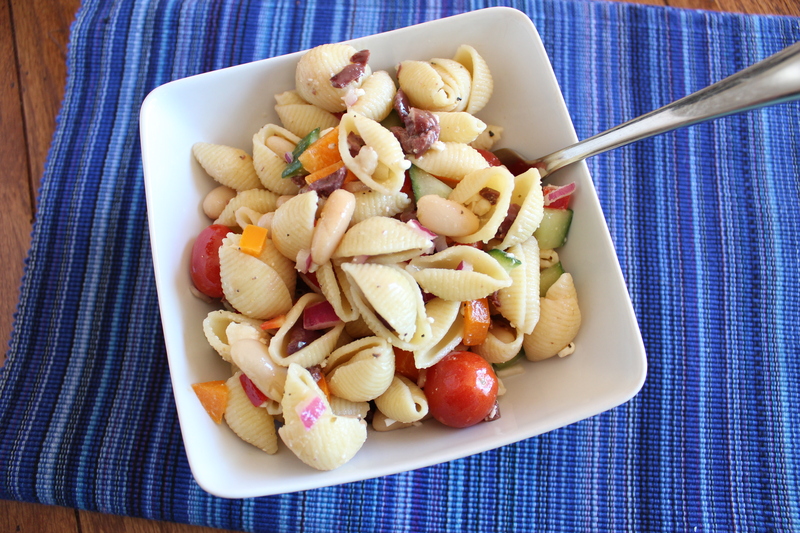 Combine tomatoes, cucumber, bell peppers, beans, onion, and olives in a large mixing bowl. Add cooked pasta and toss to combine. In a small bowl, whisk together oil, red wine vinegar, lemon juice, honey, mustard, garlic, oregano, salt and pepper. Taste and adjust seasoning to your liking. Pour over pasta and veggie mixture. Add feta and chopped mint. Stir to combine. Refrigerate until you’re ready to serve. Enjoy. That’s so exciting! Let me know what you think. It only lasted a few hours in my house- they gobbled it up. Jennie, this looks crazy good! I’m having “sweets overload” too due to last week’s baking marathon, and i need to recover. Looks like i’ll be starting with this. Thanks, Shannon. I hope you enjoy it. Let me know. We love salads at my place and this one looks awesome. So satisfying , filling and healthy! It will be made soon at my place. That sounds delicious. I love greek salads and this is an interesting twist. yeah, i totally know what you mean about having too many sweets! this sounds like the PERFECT antidote! yum!! My Mother made a similar salad when I was young and I always loved it! Yours sounds delicious as well :)! Thanks, Amy! It really is a tasty salad. I know what you mean about not being used to measuring. This whole blogging thing is making me take note of what I put into dishes for the first time. It’s slightly annoying to have to pause, but good to be able to share and recreate! I only measure when I bake. I really have to work on measuring when I cook. It is slightly annoying, but you’re right, sharing a recipe is awesome. Thanks for visiting. Easy, quick simple and mouth watering is all I have to say. 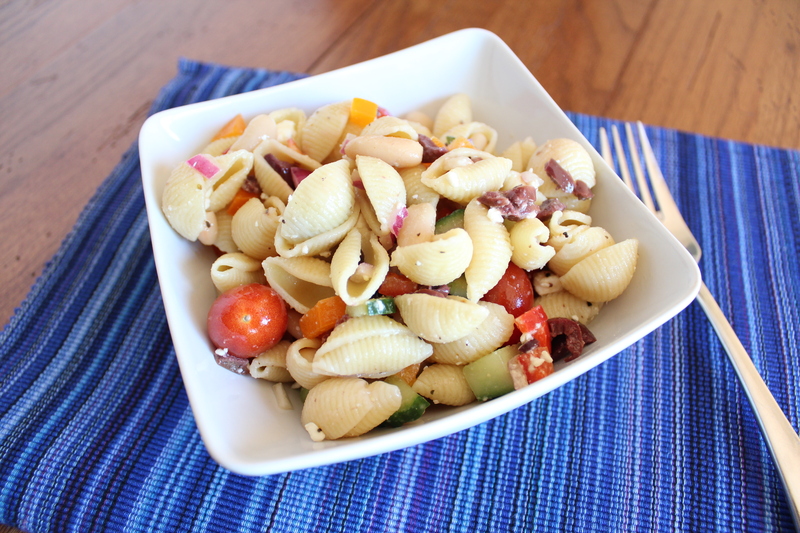 I think this might be the perfect pasta salad! Thanks, Stephanie. It really is tasty and healthy. My family loves this salad. How am I just finding this now?! What a great recipe. This will be in our summer rotation for sure. I’m glad you found it because it is such a lovely summertime salad. Enjoy! Greetings from Greece! That’s a great idea there and must be very tasty as well! We will definitely try it! Thank you so much. It’s a tasty dish. Thanks for visiting.